You are so kind-hearted! I shed a tear thinking of American generosity. “So many delightful goodies: sacks of rice, canned tuna and protein-rich biscuits, corn flour, lentils and pasta, arrived at the border of troubled Venezuela – enough for one light meal each for five thousand people”, – reported the news in a sublime reference to five thousand fed by Christ’s fishes and loaves. True, Christ did not take over the bank accounts and did not seize the gold of those he fed. But 21st century Venezuela is a good deal more-prosperous than 1st century Galilee. Nowadays, you have to organise a blockade if you want people to be grateful for your humanitarian aid. This is not a problem. The US-UK duo did it in Iraq, as marvellous Arundhati Roy wrote in April 2003 (in The Guardian of old, before it turned into an imperial tool): After Iraq was brought to its knees, its people starved, half a million of its children killed, its infrastructure severely damaged… the blockade and war were followed by… you guessed it! Humanitarian relief. At first, they blocked food supplies worth billions of dollars, and then they delivered 450 tonnes of humanitarian aid and celebrated their generosity for a few days of live TV broadcasts. Iraq had had enough money to buy all the food it needed, but it was blocked, and its people received only some peanuts. And this was rather humane by American standards. In the 18th century, the British colonists in North America used more drastic methods while dispensing aid to disobedient natives. The Red Indians were expelled from their native places, and then they were provided humanitarian aid: whiskey and blankets. The blankets had been previously used by smallpox patients. The native population of North America was decimated by the ensuing epidemics from this and similar measures. Probably you haven’t heard of this chapter of your history: the USA has many Holocaust museums but not a single memorial to the genocide near home. It is much more fun to discuss faults of Germans and Turks than of your own forefathers. First, you starve people; then you bring them humanitarian aid. This was proposed by John McNaughton at Pentagon: bomb locks and dams, by shallow-flooding the rice, cause widespread starvation (more than a million dead?) “And then we shall deliver humanitarian aid to the starving Vietnamese”. Or, rather, “we could offer to do [that] at the conference table.” Planning a million dead by starvation, in writing: if such a note would be found on the ruins of the Third Reich, it would seal the story of genocide, it would be quoted daily. But the story of the genocide of the Vietnamese is rarely mentioned nowadays. They did it in Syria, too. At first, they brought weapons for every Muslim extremist, then they blockaded Damascus, and then they sent some humanitarian aid, but only to the areas under rebel control. This cruel but efficient method of breaking nations’ spirit has been developed by lion tamers for years, perhaps for centuries. You have to starve the beast until it will take food from your hands and lick your fingers. ‘Starvation-taming’, they call it. The Israelis practice it in Gaza. They block all export or import from the Strip, interdict fishing in the Mediterranean and drip-feed the captive Palestinians by ‘humanitarian aid’. Jews, being Jews, make it one better: they made the EU to pay for the humanitarian aid to Gaza AND to buy the aid stuff from Israel. This made Gaza an important source of profit for the Jewish state. So in Venezuela they follow an old script. The US and its London poodle seized over 20 billion dollars from Venezuela and from Venezuelan national companies. They stole over a billion in gold ingots Venezuela had trustingly deposited in the cellars of the Bank of England. Well, they said they will give this money to a Venezuelan Random Dude, rather. To the guy who already promised to give the wealth of Venezuela to the US companies. And after this daylight robbery, they bring a few containers of humanitarian aid to the border and wait for the rush of bereft Venezuelans for food. Venezuelans aren’t starving, even though they are going through difficulties. The biggest noise is made by the wealthy, as always. If Pompeo wants to help Venezuelans, he might lift the sanctions, return the funds, lift the blockade. The biscuits he wants to provide are of but little use. President Maduro is right when he refuses to let this hypocrisy bribe the stomachs and hearts of his people. It is not just that he remembers his Virgil and knows, Timeo danaos et dona ferentes, “beware gift-bearing Greeks.” There are too many American and Colombian soldiers around the pending delivery place, and this place is suspiciously close to an airport with an extra-long runway suitable for a an airlift. The US is known for its propensity to invade its neighbours: Panama was invaded in 1989 to keep the Panama Canal in American hands and to roll back the agreement signed by the good-hearted President Jimmy Carter. President George Bush Sr sent his airborne troops in after calling Panama president “a dictator and cocaine smuggler”. This is exactly what President Trump says about Venezuela’s president. They are likely to use this aid to invade and suborn Venezuela. Wisely, Maduro began large military exercises to prepare the army in case of invasion. The situation of Venezuela is dire enough even without invasion. Their money has been appropriated, their main oil company is as good as confiscated; and there is a strong fifth column waiting for Yankees in Caracas. This fifth column consists mainly of compradors, well-off young folk with a smattering of Western education and upbringing, who see their future within the framework of the American Empire. They are ready to betray the unwashed masses and invite the US troops in. They are supported by the super-rich, by representatives of foreign companies, by Western secret services. Such people exist everywhere; they tried to organise the Gucci Revolution in Lebanon, the Green Revolution in Iran, the Maidan in the Ukraine. In Russia they had their chance in the winter of 2011/2012 when their Mink-Coat Revolution was played at Moscow’s Bolotnaya Heath. In Moscow they lost when their opponents, the Russia-First crowd, bettered them by fielding a much-bigger demo at Poklonnaya Hill. The Western news agencies tried to cover the defeat by broadcasting pictures of the Putin-supporters demo and saying it was the pro-Western Heath. Other Western agencies published pictures of 1991 rallies saying they were taken in 2012 on the Heath. In Moscow, nobody was fooled: the mink-coat crowd knew they were licked. In the Ukraine, they won, for President Yanukovich, a hesitant and pusillanimous man of two minds, failed to gather massive support. It is a big question whether Maduro will be able to mobilise Venezuela-First masses. If he is, he will win the confrontation with the US as well. Maduro is rather reticent; he hasn’t disciplined unruly oligarchs; he does not control the media; he tries to play a social-democrat game in a country that is not Sweden by long shot. His subsidies have allowed ordinary people to escape dire poverty, but now they are used by black marketeers to siphon off the wealth of the nation. Far from being a disaster zone, Venezuela is a true Bonanza, a real Klondike: you can fill a tanker with petrol for pennies, smuggle it to neighbouring Colombia and sell it for market price. Many supporters of the Random Guy have made small fortunes this way, and they hope to make a large killing if and when the Americans come. A bigger problem is that Venezuela had become a monoculture economy: it exports oil and imports everything else. It does not even produce food to feed its 35 million inhabitants. Venezuela is a victim of neoliberal doctrine claiming that you can buy what you can’t produce. Now they can’t buy and they do not produce. Imagine a democratic Saudi Arabia hit by blockade. In order to save the economy, Maduro should drain the swamp, end the black market and profiteering, encourage agriculture, tax the rich, develop some industry for local consumption. It can be done. Venezuela is not a socialist state like orderly Cuba, nor a social-democratic one like Sweden and England in 1970s, but even its very modest model of allowing the masses to rise out of misery, poverty and ignorance seems too much for the West. It is often said there are two antagonists in the West, the Populists and the Globalists, and President Trump is the Populist leader. The Venezuela crisis proved these two forces are united if there is a chance to attack and rob an outsider country. Trump is condemned at home when he calls his troops back from Afghanistan or Syria, but he gains support when he threatens Venezuela or North Korea. He can be sure he will be cheered on by Macron and Merkel and even by The Washington Post and The New York Times. He has the real WMD, the Weapons of Mass Deception, to attack Venezuela, and these WMD had been activated with the beginning of the creeping coup. When a rather unknown young politician, the leader of a small neoliberal rabidly pro-American fraction in the Parliament, Random Dude, claimed the title of president, he was immediately recognised by Trump, and the Western media reported that the people of Venezuela went out in mass demos to greet the new president and demand Maduro’s removal. They beamed videos of huge Caracas demos back to Venezuela. Not many viewers abroad noticed that the video was old, filmed in 2016 demos, but the Venezuelans saw that at once. They weren’t fooled. They knew that there is no chance for a big protest demo on that day, the day of a particularly important baseball game in the professional league between Leones of Caracas and Cardenales de Lara from Barquisimeto. Agence France-Press stated at 11:10 utc yesterday that “tens of thousands” would join a rally. That was at 11:50am local time. The attached video did not show “thousands” but some 200 people milling about. They lie that there are army deserters spoiling for a fight with the army. The young guys CNN presented weren’t deserters, and they didn’t live in Venezuela. Even their military insignia were of the kind discarded years ago, as our friend The Saker noticed. However, these lies won’t avail – my correspondents in Caracas report that there are demos for and against government (for Maduro slightly bigger crowds), but the feelings aren’t strong. 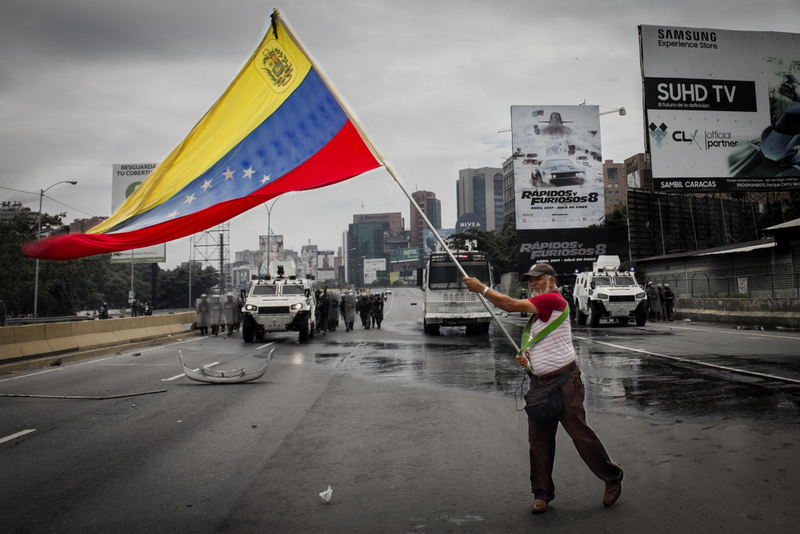 The crisis is manufactured in Washington, and the Venezuelans aren’t keen to get involved. That’s why we can expect an American attempt to use force, preceded by some provocation. Probably it won’t be a full-blown war: the US never fought an enemy that wasn’t exhausted prior to the encounter. If the Maduro administration survives the blow, the crisis will take a low profile, until sanctions do their work and further undermine the economy. In this struggle, President Trump is his own bitter enemy. He seeks approval of the War Party, and his own base will be disappointed by his actions. His sanctions will send more refugees to the US, wall or no wall. He undermines the unique status of the US dollar by weaponising it. In 2020, he will reap what he sow.